In this brief series, Dr. R.C. 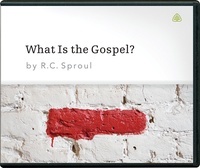 Sproul explores the basic content and meaning of the Gospel. He looks at how the word “gospel” is used in the Bible, especially in the preaching of Jesus. When people are asked on what basis they can be admitted into heaven, most respond with their own effort to be a good person. Dr. Sproul explains the fallacy of this, showing that our condition is helpless and our trust must be in Christ alone for salvation.